I made a whirlwind trip to California a month ago to find an apartment. Within 48 hours of landing, I signed a lease for my new place. I’m told these results may not be typical. The next time I would see the place would be when I arrived with all my belongings and furniture, so I wanted a way to size up the apartment to determine what would fit. I took a couple dozen measurements and made a rough sketch of the rooms in the house. The next day I turned these into a blueprint of the house using InDesign. Once I printed out this blueprint I could cut out paper rectangles to represent my furniture to see what would fit. The end product was nifty enough that I think it’s worth sharing: feng shui my apartment. Take the place for a whirl. 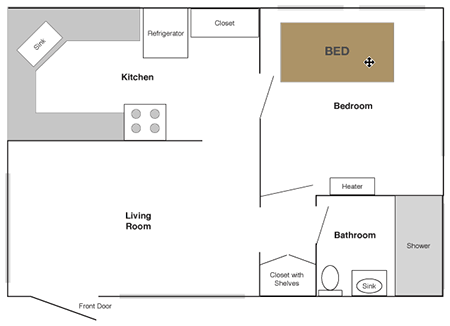 How can I set up the bed and nightstand together with that furnace in the way? Will I have room for a media center when I actually get one? And maybe you can let me know how the sofa looks over there. Note: Don’t take the “my” in “Feng shui my apartment” too literally. I wasn’t crazy about posting the actual layout of my home online, so this blueprint is actually that of a fictitious house with about the same amount of floorspace as mine.